In the Ayurvedic tradition, Agni is the inner fire that transforms what we take in – as food and water, but also as experience and emotion. 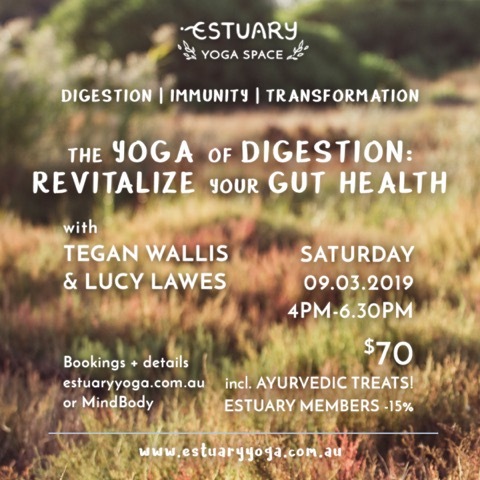 There is a lot of new research emerging in modern medicine about the connection between gut health, immunity and mental wellness; this same connection to Agni that Ayurveda has acknowledged for over 5000 years! The complex ecosystem of our body contains wisdom to heal itself; our responsibility is to create an environment that nurtures the return towards balance. This session is a chance to create a clearing, through an interactive exploration of Yoga and Ayurvedic principles. Learn to setup simple scaffolds of routines and practices that harness and support your digestive fire. Offer your body the habitat to ignite optimal health and the capacity for transformation – physiologically, energetically, spiritually. BOOKINGS: Please visit the Estuary Yoga website here.